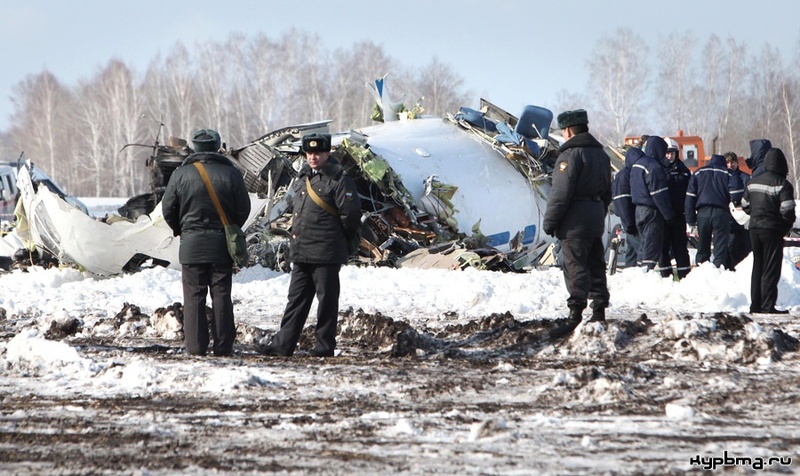 The aircraft, which fly №120, shortly after takeoff from the 21 band began to decline, and crashed on a snowy field at a distance of 1500 m from the runway threshold 03, 400 in meters to the left of the axis. The collision with the ground fuselage collapsed into three main parts: the frames to the front 21-25, 29 central to the frame (partially burnt in ground fire) and to the frame 48 tail. 4 27 crew members and passengers were killed adults, 12 passengers were seriously injured. Two of the victims died 11 and 19 April at the hospital. Total on board were people 43: 4 39 crew members and passengers. Total killed 33 people: crew 4, 29 passengers. The investigation established that before the departure the aircraft was parked at Roshchino airport about 8 hours in conditions of precipitation in the form of wet snow and rain, air fluctuations from 0 to -1 degrees Celsius and wind more than 10 m / s. Therefore, all the conditions existed for the formation of ground icing. Stronger ground icing should be subjected to the right side of the aircraft, located on the windward side during the most intense precipitation. On-duty change of the meteorological center of Roshchino airport timely warnings about ground icing conditions were compiled, they were brought to all interested services, including the dispatcher of UTair-Technik LLC and representatives of UTair. However, the flight was not canceled.